Gilder Lehrman Collection #: GLC01427 Author/Creator: Columbus, Christopher (1451-1506) Place Written: Rome Type: Pamphlet Date: 1493 Pagination: 8 p. ; 19.6 x 13.9 cm. 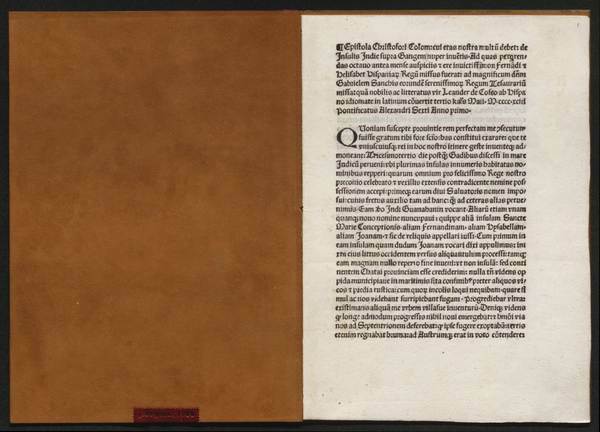 Summary of Content: First edition, in Latin, second (corrected) issue, printed at Rome after 29 April 1493. Gothic type; 33 lines per page. Pamphlet printing letter to King Ferdinand and Queen Isabella of Spain concerning his first voyage to America, the so-called Barcelona letter. The earliest printed Columbus letter, describing his discovery of the Caribbean islands of Juana and Hispaniola.